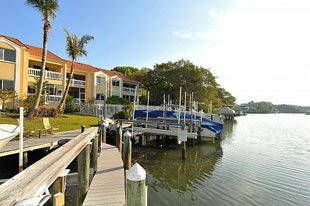 It would be a smart move to start a search for a waterfront property in the Sarasota Fl real estate market at Hudson Landings. Besides having direct access to the tranquil Hudson Bayou that leads to the scenic Sarasota Bay, this community is also conveniently located next to principal streets in Sarasota’s downtown district. It is situated on Hudson Avenue near this road’s junction with Mound Street only a short distance west of the strategic Tamiami Trail. This neighborhood is a condominium community comprised of just twelve townhouse-type units. The condo complex was developed in 1989 and its landscaping has matured to include lush trees and well-maintained grounds verdant with various plantings. The condos’ roofing was replaced in 2007with new metal tiles which carry a fifty-year warranty. Many of the homes at Hudson Landings have also been upgraded including updates on windows and terrace screen panels to comply with the current hurricane code standards. The floor areas of the residences measure from 1,362 to 1,556 square feet, featuring two to three bedrooms with either two or three baths at each unit. Some of the interior features among choice residences include solid wood flooring, brick fireplace and vaulted ceilings enhanced with wood beams. Primarily due to the limited number of units and the strong appeal of these residences, it is only occasionally that one can be found among Sarasota condos for sale. As an indication though, past deals on Hudson Landing real estate properties showed that ownership of a unit has changed hands at the high $300s. 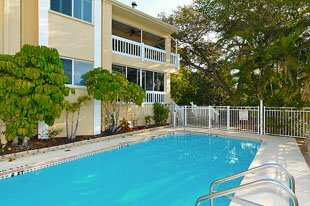 Besides the boat slips available at the condominium complex, the neighborhood also has a heated swimming pool. What could further whet buyers’ interest in Hudson Landings for sale is the residences’ proximity not only to downtown life and leisure establishments. The property is also located near learning institutions like the Suncoast School for Innovative Students, Sarasota High, and Brookside Middle School. Health care facilities, such as those at the Sarasota Memorial Hospital, are also nearby. A homemaker’s daily needs can likewise be easily filled at the Crossroads Shopping Center at the intersection of Mound St. and the Tamiami. For even more choices, the Sarasota downtown is only a few minutes north of the community and additionally offers classy entertainment centers like the Burns Court Cinema and the Florida Studio Theater.Popular restaurants are also around the area including some local favorites such as Word of Mouth and Owens Fish Camp. As equally delightful, the links that have consistently helped sell Sarasota real estate properties are within easy reach from the community. One is the executive golf course of Village Green, an 18-hole, par 58, 2,810-yard layout. 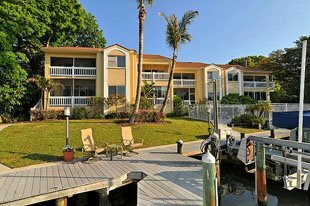 And of course best of all, Hudson Landings condos for sale present accessibility, either by land or water, to Gulf Coast attractions such as those at Siesta Key and the Lido Key. Below are all of the current real estate listings available for sale at Hudson Landings.